Honoring and remembering your loved one starts with choosing a funeral home that will treat them with the dignity, respect, and honor they deserve. Grieving the death of a loved one is difficult work. It requires you to experience both physical and emotional pain as you slowly work through your grief and come to a point where you can honor your loved one while moving on with your life. 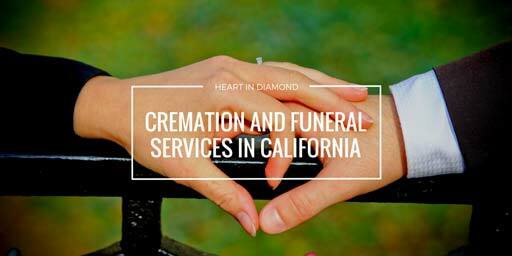 Here at Heart In Diamond, we have the opportunity to work with many funeral homes in California as we transform cremains into beautiful memorial diamonds for the deceased’s loved ones. Here is a look at 8 of the top recommended funeral homes offering tender and compassionate but professional services that can help grieving hearts begin to heal. California Cremation and Burial Chapel uses 38 years of experience to assist San Diego area families in remembering their loved ones. Located in the San Diego area, California Cremation and Burial Chapel is an individually owned full-service funeral home with two locations serving Central San Diego, South Bay communities, and all of Southern California. They have three chapels that can accommodate small, medium, and large gatherings without losing intimacy. California Cremation and Burial Chapel uses their dedicated 38-years experience to offer compassionate, traditional burial and cremation funeral services to families from all cultural backgrounds. They have a skilled and exclusive on-site team that tailor-fits the needs of those who are bereaved down to the last detail. Preferred Cremation and Burial supports families while offering a variety of burial and cremation services. Preferred Cremation and Burial are concerned not just with the burial or cremation of the deceased but also with supporting grieving families and friends. That is why they offer a year of daily grief support emails for those who have lost loved ones. It is also why they offer some of the lowest priced services in the San Diego area. They want to make the process of caring for and remembering a loved one as easy as possible. They’ve been successfully helping the bereaved to do this for more than 20 years. Stonebridge Funeral and Cremation Services honors the deceased loved one with personalized and beautiful details. Grief is not a process of forgetting. It is the process of learning to cope while remembering. All Seasons Burial and Cremation offers full services and support for grieving families. All Seasons Burial and Cremation in Sacramento, CA, promises clients a customized and loving service remembering their loved ones. All Seasons recognizes the importance of remembering and honoring the deceased. This importance is highlighted in The Quoting Bear’s Twitter reference to George Bush’s statement that “Grief and tragedy and hatred are only for a time. Goodness, remembrance, and love have no end.” All Seasons uses a variety of burial and cremation packages to help customers create a remembrance ceremony of their deceased loved one that will honor them in the long term. Gold Coast Cremation offers families experience and guidance through the cremation process. Gold Coast Cremation offers Southern Californian families more than 25 years of experience in finding the perfect cremation solution for their loved ones. Gold Coast focuses on making the process simple and easy while offering personal, 24/7 service. In addition, Gold Coast offers families a range of grief support resources, as well as guidance through the process of finding documents, telling others about the death, and more. Rose Hills Memorial Park and Mortuary brings more than 100 years of experience to its burial and cremation services. What began as an 18-acre cemetery in 1914 has grown into a 1,400 acre memorial park, as well as comprehensive funeral services offered at six locations. Rose Hills Memorial Park and Mortuary prides itself on offering families everything they need to remember their loved one. An active, philanthropic member of the community, Rose Hills provides funeral and cremation services, free grief counseling and a grief hotline, 24/7 availability, and transparent pricing. Fred Young Funeral Home promises high quality, compassionate funeral and cremation services within Northern Sonoma County. With two locations in Northern Sonoma County, Fred Young Funeral Home offers families a range of funeral and cremation services for their loved ones. This 5-generation owned family business strives for perfection in its service to grieving families and engages in a number of community events designed to help families remember their deceased loved ones. Callaghan Mortuary and Livermore Crematory offers a range of services to help grieving families find the right burial or cremation solution for their loved ones. Since 1906, Callaghan Mortuary and Livermore Crematory has been helping grieving families in the area through the process of burying or cremating their loved ones. One of only 17 independently owned funeral homes in California, Callaghan prides itself on professional service, a range of options and genuine concern for families. All of these funeral homes respect the personal nature of grief and the fact that it manifests itself in different ways. Their customized burial options, emphasis on grief resources, and compassionate support of families reflect their understanding of Heal Grief’s insight that “You have to do what is right for yourself. No one else is walking in your shoes.” Because each of these businesses gives families space to do what is right for them and their deceased loved ones, they ease the pain involved when honoring and remembering loved ones.